Source: Department of Energy Appliance & Equipment Standards Program, Technical Support Documents. When consumers purchase new appliances, they usually have several options with various features and energy-consuming characteristics. Energy-efficient equipment is designed to provide a given level of energy services such as heat, light, or refrigeration using less energy and thus at a lower energy cost. But in most cases, equipment that is more efficient also costs more. Because of this, consumers must weigh expected energy savings against the up-front incremental costs of more efficient equipment. 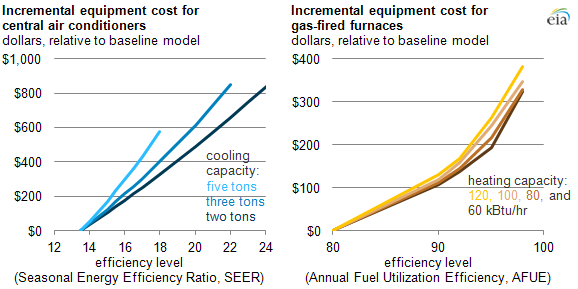 In most cases, the relationship between efficiency and added cost is not linear. For refrigerator-freezers, an efficiency improvement of 20% over a baseline model with similar features might add $50 to the purchase price. Increasing efficiency beyond that is nonlinear: a 25% more efficient model might be $100 more expensive, and a 30% more efficient model might be $200 more. Buying the most efficient model available could cost more than $250 more for a 30%-35% increase in efficiency above the baseline model. Efficient models are often bundled with aesthetic or other functional features not related to energy use (like a refrigerator's stainless steel cover or adjustable shelves) that tend to be offered only on premium models, meaning the incremental costs reflect upgrades and options beyond those directly related to efficiency improvement. In other cases, efficiency enhancements provide additional benefits. For instance, adding insulation to a dishwasher not only improves thermal performance but also makes the dishwasher operate quieter. Because these calculations are not necessarily simple, the ENERGY STAR program offers an appliance savings calculator to calculate savings on an annual basis, savings over the lifetime of the appliance, and expected payback periods of efficient equipment compared to baseline models. These calculators are based in part on EIA data for electricity and natural gas costs by state, but consumers can use their individual energy costs if desired. To make the most accurate cost comparisons, consumers can also enter cost and performance attributes of specific models they are considering. Because utilities and governments may offer incentives for installing more efficient appliances, the value of any rebates, tax credits, or other incentives can also be factored into the calculators. Similar calculations for efficiency savings for various heating, cooling, and water heating equipment often require more information, so ENERGY STAR maintains separate calculators for these equipment types. More information about ENERGY STAR products and savings calculators can be found on the products page of the program website.